PLEASE NOTE: Due to a prior commitment, the next ship will be posted on Thursday, September 1. Thank You. Figure 1: USS New Mexico (BB-40) photographed from an airplane while steaming in line with other battleships, 13 April 1919. Note S.E.5A airplane on the flying-off platform atop the battleship's second turret. US Naval Historical Center Photograph. Click on photograph for larger image. 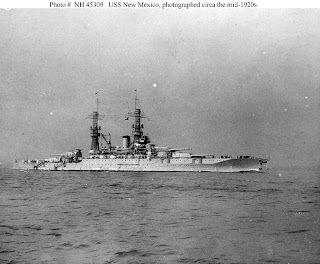 Figure 2: USS New Mexico (BB-40) photographed during the early or middle 1920s. Note anchors hanging from her bow. US Naval Historical Center Photograph. Click on photograph for larger image. Figure 3: USS New Mexico (BB-40) photographed by Tai Tsing Loo in Pearl Harbor, Hawaii, in about 1935. Collection of Fleet Admiral William D. Leahy. US Naval Historical Center Photograph. Click on photograph for larger image. Figure 4: USS New Mexico (BB-40) off the Puget Sound Navy Yard, Bremerton, Washington, following overhaul, 6 October 1943. A barge and motor launch are alongside her port quarter, with sailors coming on board from the latter. Official US Navy Photograph, from the collections of the Naval Historical Center. Click on photograph for larger image. Figure 5: USS New Mexico’s 5-inch guns prepare to fire during the bombardment of Saipan, 15 June 1944. Note time-fuse setters on the left side of each gun mount, each holding three "fixed" rounds of ammunition, and triple 14-inch guns in the background. Official US Navy Photograph, now in the collections of the National Archives. Click on photograph for larger image. 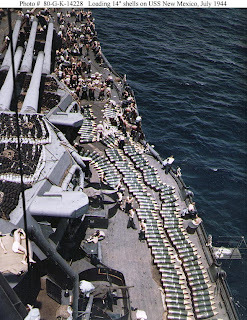 Figure 6: USS New Mexico’s 14-inch projectiles on deck, while the battleship was replenishing her ammunition supply prior to the invasion of Guam, July 1944.The photograph looks forward on the starboard side, with triple 14-inch gun turrets at left. Note floater nets stowed atop the turrets. Official US Navy Photograph, now in the collections of the National Archives. Click on photograph for larger image. Figure 7: USS New Mexico (BB-40) firing her after 14-inch guns during the pre-invasion bombardment of Guam, circa 14-20 July 1944. Taken by a Combat Photo Unit Two (CPU-2) photographer, looking aft along the port side from the forward sky lookout position. Official US Navy Photograph, now in the collections of the National Archives. Click on photograph for larger image. Figure 8: USS New Mexico (BB-40) at sea with two other battleships and an amphibious force command ship (AGC), probably at the time of the Iwo Jima or Okinawa operations, circa February-April 1945. Battleship in the center background is USS Idaho (BB-42). The one further to the left is either Tennessee (BB-43) or California (BB-44). Official US Navy Photograph, now in the collections of the National Archives. Click on photograph for larger image. 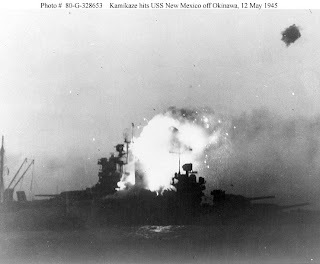 Figure 9: USS New Mexico (BB-40) is hit by a "kamikaze" at dusk on 12 May 1945, while off Okinawa. Photographed from USS Wichita (CA-45). Official US Navy Photograph, now in the collections of the National Archives. Click on photograph for larger image. Figure 10: USS New Mexico (BB-40) anchored in the Tokyo Bay area, circa late August 1945, at the end of World War II. Mount Fuji is in the background. US Naval Historical Center Photograph. Click on photograph for larger image. USS New Mexico (BB-40) was the lead ship of a class of three 32,000-ton battleships and was built by the New York Navy Yard at Brooklyn, New York, and commissioned on 20 May 1918. The ship was approximately 624 feet long and 97 feet wide, had a top speed of 21 knots, and had a crew of 1,084 officers and men. As built, New Mexico was armed with 12 14-inch guns, 14 5-inch guns, and four 3-inch guns, but this armament changed dramatically during the course of the ship’s career. 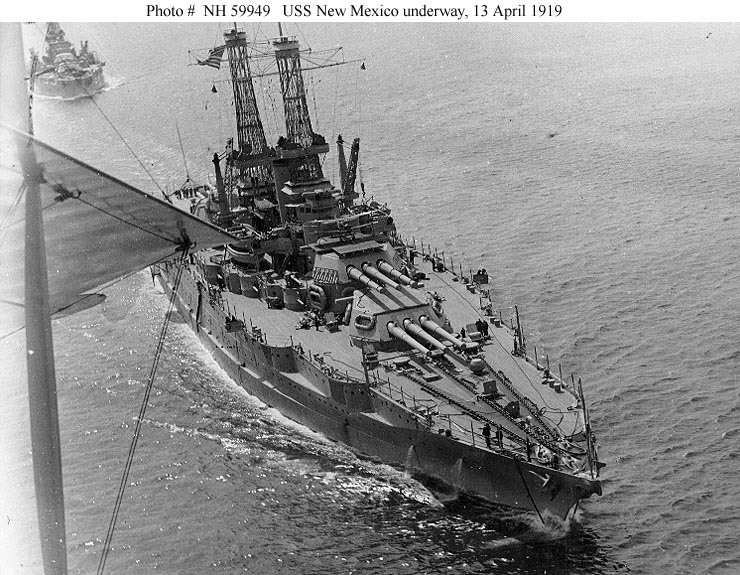 New Mexico was commissioned during World War I and spent the rest of the war patrolling off the east coast of the United States. She did, however, travel to Europe early in 1919 and escorted President Woodrow Wilson back to the United States from the Versailles peace conference in France. 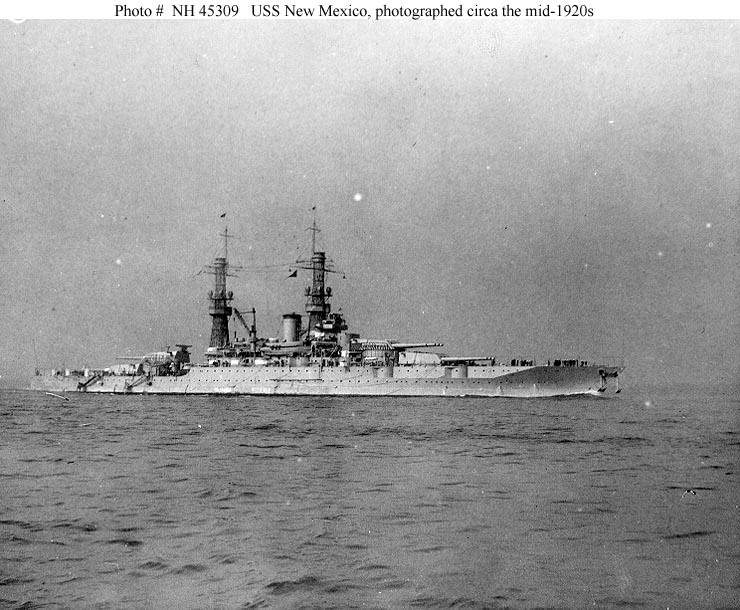 Later that year, New Mexico became the flagship of the US Pacific Fleet. She participated regularly in Battle Fleet exercises in both the Pacific and the Caribbean in the 1920s and the 1930s. The ship also visited Australia and New Zealand in 1925 and made numerous stops at South American ports during the 1920s. New Mexico was overhauled and extensively modernized at the Philadelphia Navy Yard in Philadelphia, Pennsylvania, beginning in March of 1931. The massive job was completed in January 1933 and it greatly altered her appearance. 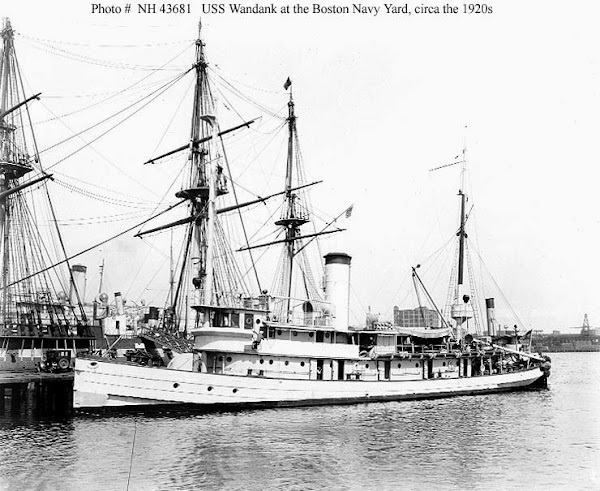 The ship’s original “cage” masts were replaced by a then-modern tower superstructure, and many other modifications were made to both her armament and thick armor protection. In 1940, New Mexico was based at Pearl Harbor, Hawaii, as a deterrent to the Japanese Navy, but the ship was transferred to the Atlantic in May 1941 to reinforce the US Atlantic Fleet in case of war with Germany. 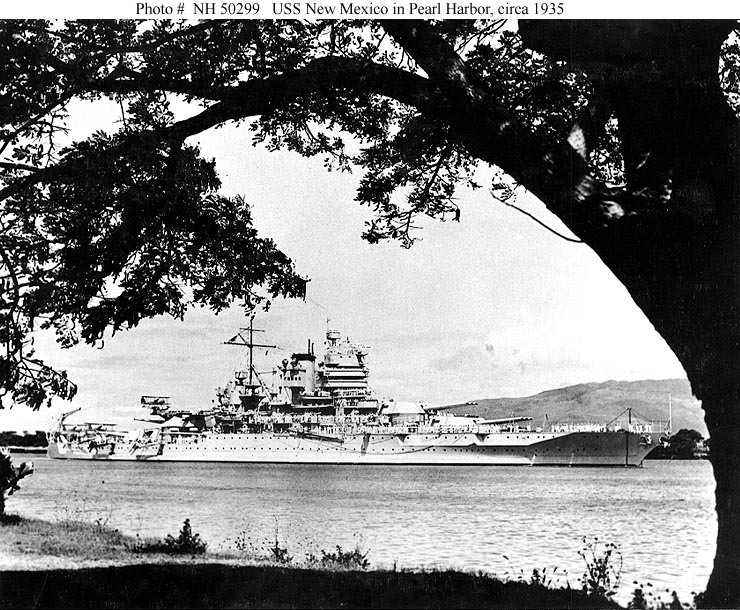 After America entered World War II on 7 December 1941, New Mexico returned to the Pacific in early 1942 to assist the Pacific Fleet that had been shattered at Pearl Harbor. During most of 1942, New Mexico patrolled off the west coast of the United States and around the Hawaiian Islands. From 6 December 1942 to 22 March 1943, New Mexico patrolled and escorted convoys in the southwest Pacific. She then steamed back to Pearl Harbor and went on to participate in the Aleutians campaign to recapture the islands of Attu and Kiska from the Japanese. On 17 May 1943, her massive guns were a major part of the bombardment of Kiska, which forced the Japanese to abandon the island a week later. 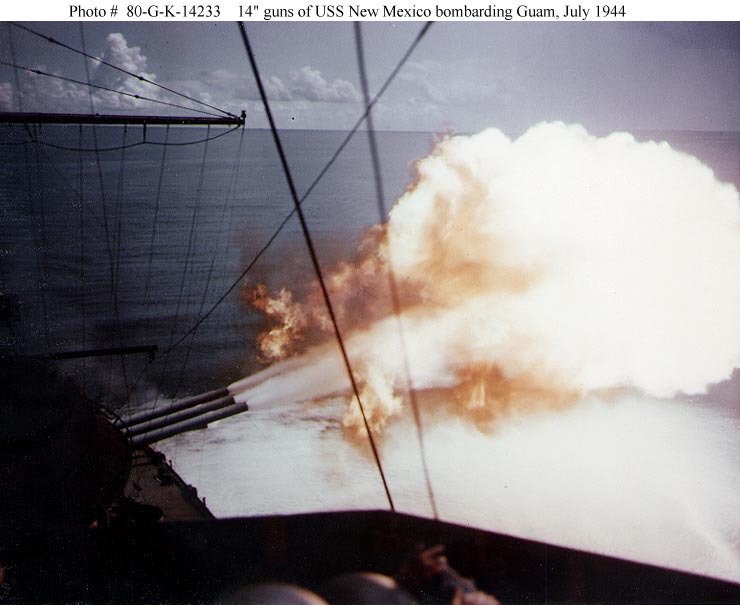 In late 1943 and early 1944, New Mexico provided heavy gunfire support for the invasions of the Gilbert and Marshall Islands. She bombarded Japanese positions on New Ireland in March of 1944, and in June and July New Mexico assisted in the successful American amphibious assaults on Saipan, Tinian, and Guam. 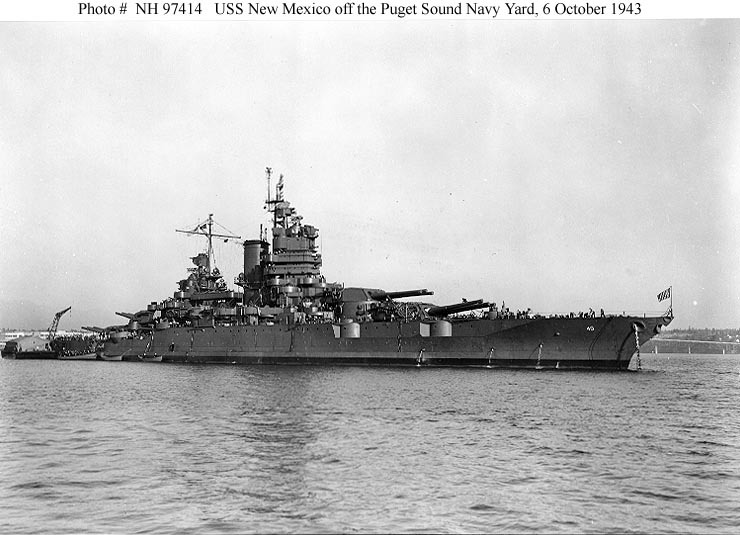 After those campaigns, New Mexico was sent to Bremerton, Washington, for an overhaul that lasted from August to October 1944. The ship was sent right back into battle and participated in the invasion of the Philippines. 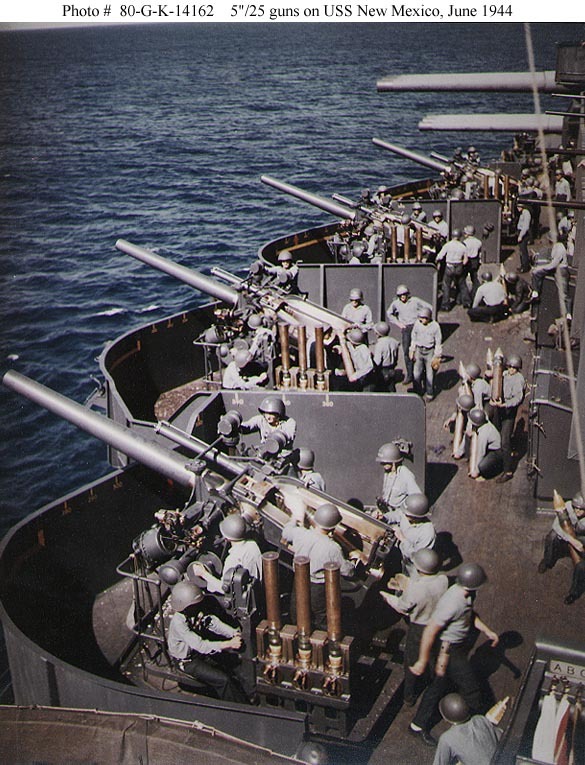 On 22 November, New Mexico arrived off Leyte Gulf and provided anti-aircraft cover for the troops heading for the beaches, and also served as a floating artillery platform to bombard enemy positions on shore. During the invasion of Luzon in the Philippines, New Mexico was constantly attacked by Japanese kamikaze suicide planes. On 5 January 1945, while bombarding enemy positions on shore, a kamikaze scored a direct hit on the bridge of the ship. The explosion killed New Mexico’s commanding officer, Captain R.W. Fleming, as well as 29 other crew members. Eighty-seven men were injured in the explosion and resulting fire. But the ship’s guns remained in action as the rest of the crew temporarily repaired the damage. The tough battleship remained in action until 9 January and then was ordered to return to Pearl Harbor for more permanent repairs. After being repaired at Pearl Harbor, New Mexico was sent back into the thick of things. She left Pearl Harbor on 21 March 1945 and joined the invasion force for Okinawa. On 26 March, New Mexico and other ships in her task force opened fire on Okinawa. New Mexico kept up the bombardment until 17 April, as troops struggled on shore against the Japanese. 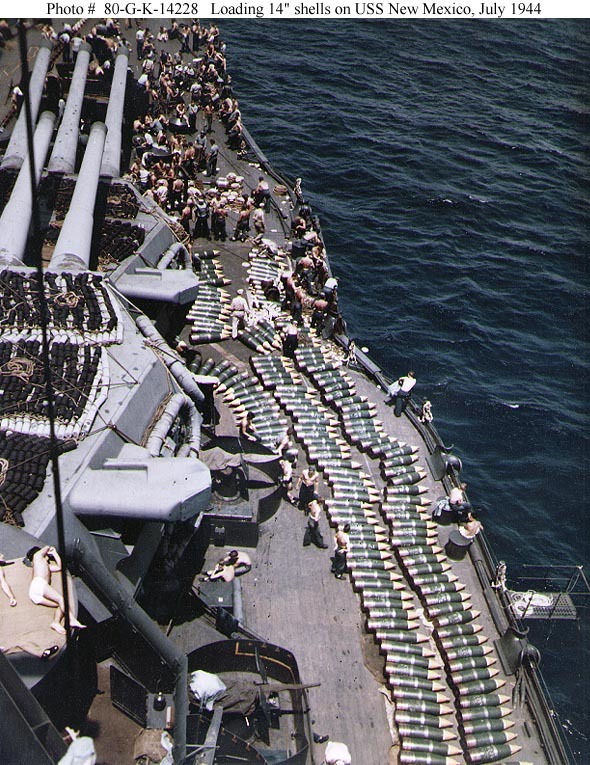 On 21 and 29 April she again provided gunfire support for the troops on shore, and on 11 May New Mexico destroyed eight Japanese suicide boats that tried to ram the ship. But on 12 May, two kamikaze aircraft speeded toward the battleship. The first dove at her and missed as the ship put up a hail of anti-aircraft fire. But the second plane, which was also carrying a bomb, hit New Mexico. There was a giant explosion followed by an intense fire. Fifty-four men were killed and 119 were wounded. But once again New Mexico’s crew rose to the occasion and managed to put out the roaring fire within 30 minutes. 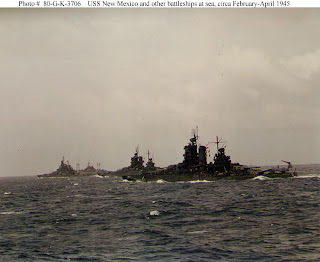 On 28 May, New Mexico steamed to Leyte for repairs. 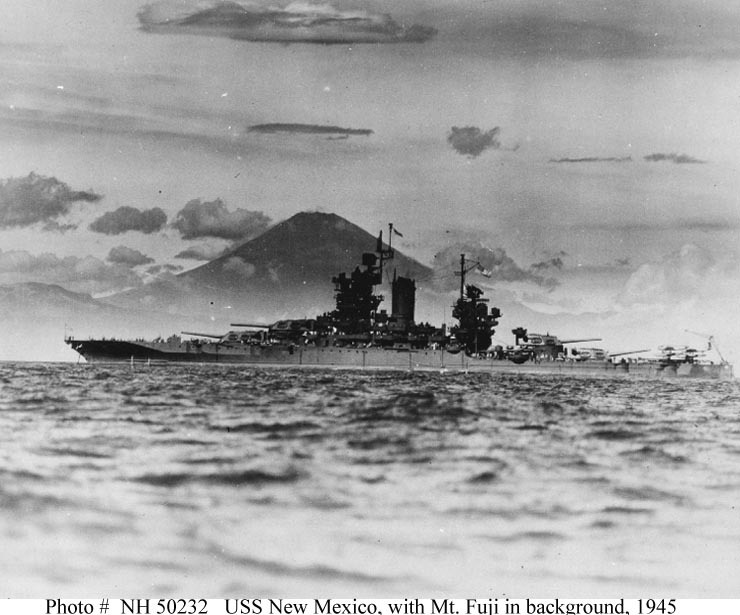 During the last few days of World War II, New Mexico began rehearsals in the Philippines for the invasion of mainland Japan. But with the dropping of the atom bombs, the war suddenly ended. 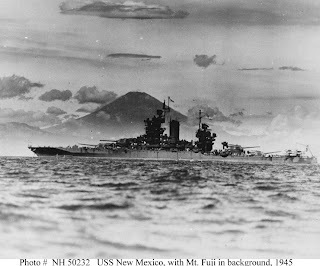 On 16 August, New Mexico steamed to Okinawa to join the American occupation forces that were gathering there. She was present in Tokyo Bay when Japan formally surrendered on 2 September 1945. After that, New Mexico returned to the United States. She transited the Panama Canal and reached Boston, Massachusetts, on 17 October 1945. USS New Mexico was decommissioned there on 19 July 1946 and was sold for scrapping on 13 October 1947. The ship served in two World Wars, participated in numerous amphibious assaults, was hit and seriously damaged twice by Japanese kamikaze aircraft, and received six battle stars for her service during World War II.